OK, so it’s only October. However… we’re all frantically busy moment, preparing for Christmas. Our goal is for every single person we know to include something from Y natural on their Christmas gift list. Yes, we’d love you to give gifts that are Australian made, Australian Certified Organic and Certified Cruelty Free, purchased from Y natural as a 100% Australian owned company. But it’s more than that. 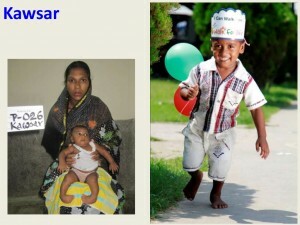 Part proceeds of our Christmas gifts go to Walk For Life – every $120 we raise for Walk For Life profoundly changes the life of another child born with clubfoot in Bangladesh, giving them a future that would otherwise be out of their reach. Our gifts are perfect for Christmas, the office Kris Kringle, ideal for your stash of emergency gifts for when you get caught by surprise or need a little something to take with you when you go to a dinner or party. Suitable for men and/or women of all ages, these gifts are lovely, thoughtful and personal. The gifts are special limited edition body products are in the $20-$40 range, so they are affordable and the sort of product anyone would absolutely love to receive. We’re taking pre-orders for these gifts. If these don’t meet your needs, please could you tell drop us a line at info@ynatural.com.au to tell us what specifically needs to change / be provided for a Y natural gift to be right for you. We will do our best to make it happen. We are also able to do gift baskets or corporate gifts, should the idea of giving truly meaningful gifts resonate with you. These will be priced according to what you decide to put in the baskets. Thank you in advance for supporting a South Australian business that does all it can to conduct its business in a way that is good for our community and our environment, and that is doing its best to help to make a difference to people who are less fortunate than ourselves.